flowers for flower lovers. 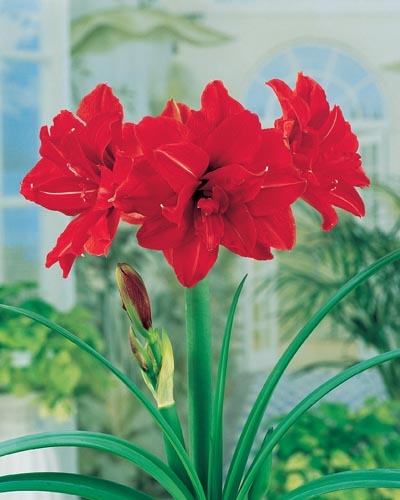 : Amaryllis Red-Lion flower bulb (Hippeastrum ) Amaryllis Flowers. Amaryllis Red-Lion flower bulb (Hippeastrum ) Amaryllis Flowers. Blooming Time: Blooming time: December-May. 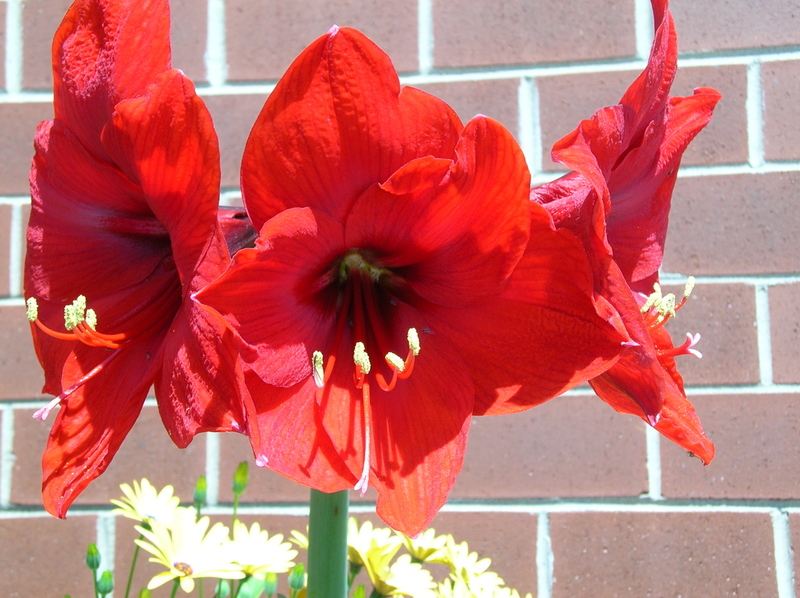 Amaryllis can be forced to bloom any time of the year. Propagation: Amaryllis is propagated by bulbs, but may be grown from seed. Expect flowers the third year from sowing. 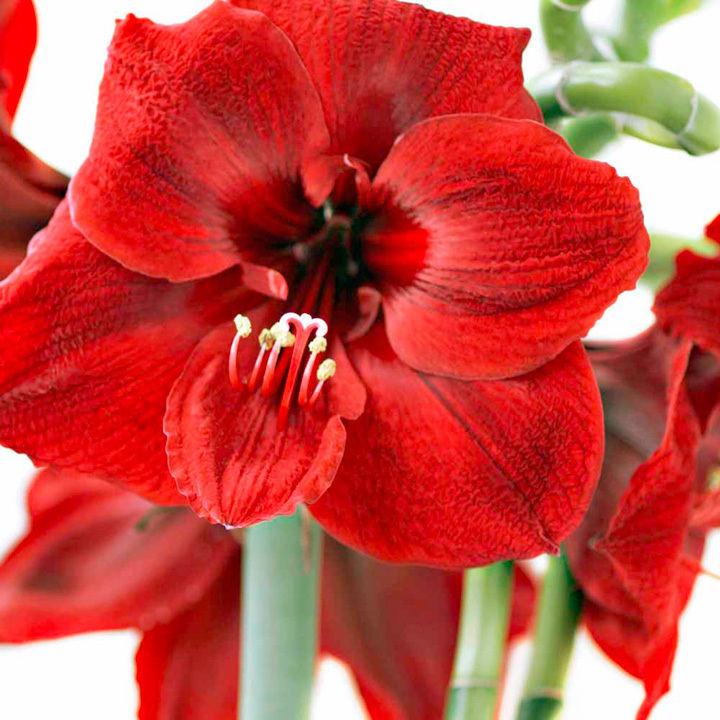 Amaryllis is one of the most brilliantly coloured spring bulbs. The cultivated kinds are largely hybrids or variants and often of complex parentage. Pot Amaryllis in a pot large enough to leave an inch of soil around the bulb--a 5 to 7 inch pot is usually adequate. The best soil is composed of fibrous loam, leaf mould and sand with a neutral or slightly alkaline reaction. The bulb should be planted so as to leave the upper third exposed above the soil line. Water Amaryllis well after potting and then water sparingly until root growth has started (lukewarm water helps). Temperatures of 60 to 70 degrees are suitable for forcing. Lower temperature of 45 to 50 degrees will delay flowering. About 8 weeks after potting Amaryllis, they should bloom. 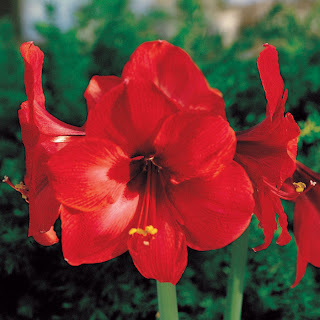 When Amaryllis is in full growth, they should be watered frequently and fed a balanced fertilizer once a month. They enjoy full sunlight during the growing season. However when coming into flower, partial shade helps to bring out their brilliant colour After Amaryllis has flowered, it should be kept growing throughout the summer. When leaves dry out, the plant should be kept in a cool, dry, and dark location until they begin to show signs of growing in late fall or winter. The plant should be left in the same pot and given a top dressing of some type of compost. When ready trim dead roots and remove dry outer layers. Soak the bulb in lukewarm water for about six hours. To plant the bulb as a house plant you should choose a clay pot that is 2 inches wider than the bulb. Amaryllis care after spouting requires removing it from any heat source and rotating the pot weekly while watering very sparingly. Bulb rot is a common problem with amaryllis if you keep the plant too wet.To propagate from seeds do so 4 weeks after the seed pod has formed. Allow the seeds to dry for a few days and then plant them in a partially shaded area that is well drained. When the seeds germinate, they need more light.To propagate from offsets look for bulbs growing along side the main bulb in the fall. Replant those bulbs that are half the size of the mother bulb immediately.To propagate from cutage during the summer, cut the bulbs vertically into at least four pieces, making sure each cut part has at least two parts connected to the basal plate. Apply a fungicide dust to the pieces and plant them base down so that at least a third of the bulb is above ground. These are lovely plants, requiring very little in the way of care, as long as you remember not to over water, and to plant the bulb with at least 1/3 of the bulb showing while doing your amaryllis care. Then sit back and enjoy the splendid flowers. Labels: Amaryllis Red-Lion flower bulb (Hippeastrum ).